I would be completely disingenuous if I didn’t admit to my overall disappointment with the final chapter in this prolonged (should be) trilogy. I don’t think that the first half (Mockingjay Part 1) is a bad movie. I just don’t think it feels like a full movie or story of any kind. I don’t think there are any bad scenes in it. I just think there are lots of unnecessary or overlong scenes. The new one is significantly better, but it also stretches the material out beyond what is necessary. The bottom line is that there was just never any good reason for this story to get stretched out over 2 movies and the entire series suffers for it. What could have easily been one of the greatest Sci Fi trilogies of all time has to settle for just being a good Sci Fi series. After the greatness of ‘Catching Fire’, that is absolutely one of the great disappointments of this decade. A tighter story could have been such a breathless finale that I might have liked it even better than the brilliant middle, but sadly that’s just not what we get. Still, I’m being negative when the film in question is actually pretty damn good. The whole thing moves with much more purpose this time around and the bittersweet finale is truly thought provoking in its execution. There is also a unique poignancy to the wars conclusion that is quite perfect for the times. Not to mention that the whole thing is just generally more exciting. There are rousing speeches, massive action sequences, large explosions, friends turning on one another, and an encounter with some underground monsters that is quick unforgettable. There is also a horrible bombing sequences here that illustrates the horror of war in a way that no other YA movie is likely to come close too. 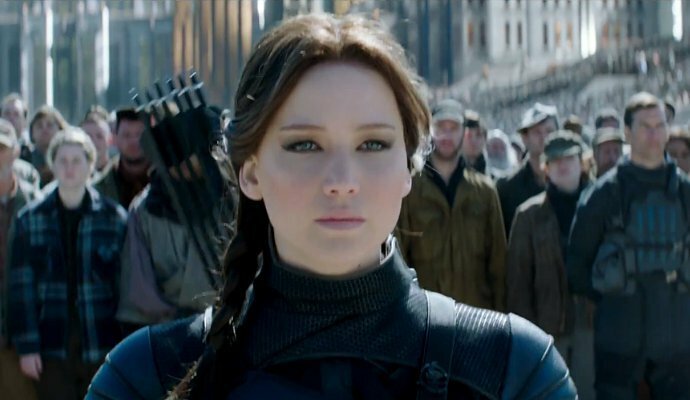 ‘The Hunger Games’ has always been so much more than a teen movie series and this one really cements that. The movie begins with a scene that could literally have just been the next scene in the last movie. These two films really are just one long movie. We start with Katniss regaining her voice after being nearly strangled to death by the man she loves. After a group of scenes with various people trying to help Peeta (Josh Hutcherson), it becomes clear that he has been endlessly tortured at the hands of the Capitol. Not for the purpose of information, but as a tool for propaganda and now murder. Katniss is furious about this whole thing and fed up with just being a tool for rebel propaganda. So, she sneaks on to a ship and heads into the war zone. It doesn’t take long for the controlling Coin (Julianne Moore) to send a group out with her, but their purpose is not to help her. No, they are to be there to make more propaganda videos and quite possibly film the death of the Mockingjay. Luckily for the viewer, President Snow has turned the Capitol into Hunger Games number 76 and booby trapped the whole damn city. These traps make for very entertaining spectacle, but provide some unique danger to our hero and her allies. Will she make it to President Snow’s mansion and take him out. Well, for all of you who haven’t read the book, you will just have to see. The ending is certainly more Lord of the Rings’ than I would have liked it to be (never ending), but it’s still satisfying. I shed a tear or two and felt like I got to a logical conclusion. More importantly though, I watched a story about a female protagonist who changes a nation. Katniss is a Joan of Arc for this generation and Jennifer Lawrence has delivered a character that will never be forgotten. My hat is off to her and the entire team of filmmakers that brought this to us. I just wish that the folks at Lionsgate would have been less money hungry. Then we might have gotten a finale worthy of this epic and important series.